Work done in Junior High through College. Working at the Potters Studio in Berkeley CA. Working from my home studio in Fremont CA. Although there may still be some examples of my very early work at my parents home, I don't have any in mine. I do however have lots of the pottery that I have made since arriving in California. The following are examples of my current work, with a bit of the older stuff thrown in for good measure. The pictures immediately below are of older pots made at the Potters Studio. The newer pots are created in my current (and only) house. Notice that the glazes are very different. This is because I have had to create a whole new palate of glazes now that I am firing cone 6 in an electric kiln instead of cone 10 in a gas kiln. A little history here This is a collection of old and new pots sitting on the mantle above my fireplace. They reflect various stages of my potting career The blue, red, and black bottles are old work The white bottles are tests for new work, fired in the electric kiln in my house. Work from the new kiln. Vase from first full kiln of new work. Mountain landscape on white background. 8.5". Large bowl From same kiln. 5"x11.5"
Large bowl From same kiln. 5"x11.5" Interior of same bowl showing brushed oxide decoration. Vase. Same kiln. 6". Jug. Same kiln. 6.5"
A bit more time and effort, and another load of ware is fired. The pots shown are some of the best from the firing, but are not the only good pots to emerge from this kiln load. It should be noted that all current work is part of a process of learning the characteristics of the clay, glazes, and decorating process. Each subsequent kiln load of pots should reflect the process of experimentation and growth. 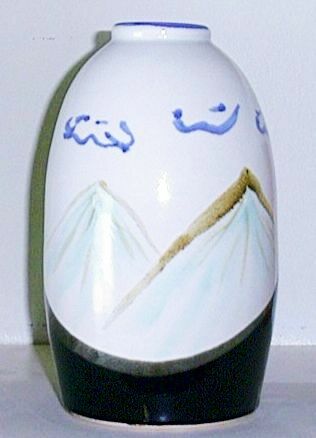 Small bottle form. 6" Clay goblets. Left to right: 5.25", 6", 5.5"
Small long necked vase. 5.25" Mugs and small vase. Left to right: 4", 3.75", 3.5"
Open mouthed vase with flaring lip. 6.5" Soup sized bowl. 2.5"x9.5"
Interior of same bowl, showing brushed decoration. Large bowl. 5"x12.5"